Cristal shimmers on the palate, showing great depth in its sumptuous layers of fruit. It is a magnificent wine with superb length and exceptional balance. White peach and acacia blossom aromas accent flavors of poached apple, gingersnap biscuit, pastry cream and spun honey in this harmonious Champagne. One bottle of Louis Roederer Brut Cristal Champagne. 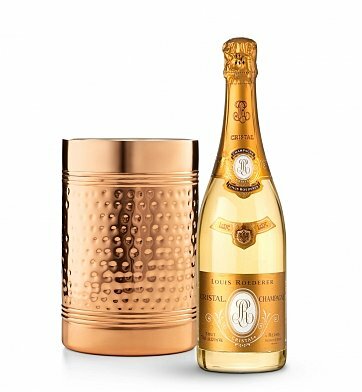 Cristal Brut with Double Walled Wine Chiller is a hand delivered gift. These gifts are delivered by one of our local design centers located throughout the United States and Canada. Same day delivery is available for most gifts when ordered before the cutoff time. The cutoff time for Cristal Brut with Double Walled Wine Chiller is in the recipient's time zone. Featuring Louis Roederer Cristal Brut Champagne. Bronze-finished, polished and hammered double-walled chiller. Arrives presentation-ready with an attached card bearing your personal message.